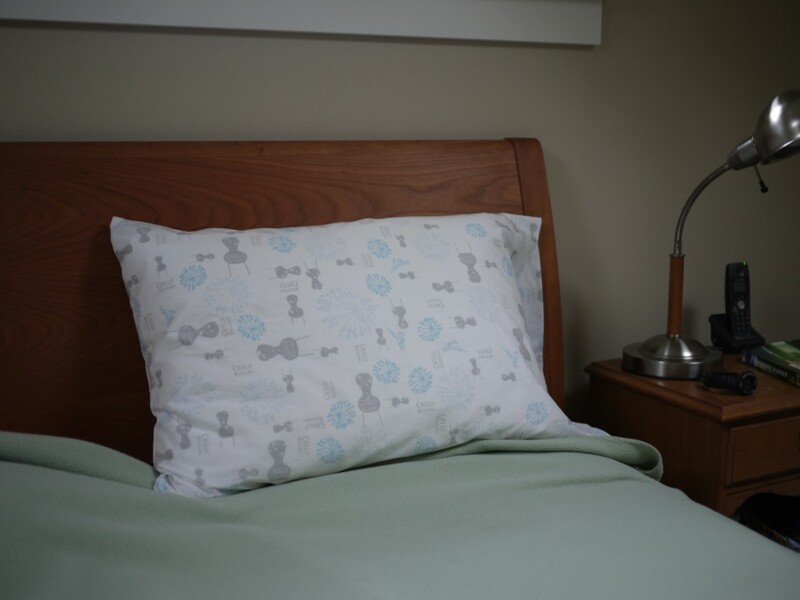 My mother had been harassing me for quite some time about making her some pillowcases. I don’t know why she can’t just go to Macy’s like other people and buy some. Kidding. Anyway, I had forgotten what nice instant gratification one can get from sewing up pillowcases. Really, you only need a yard of fabric and a couple of minutes. One of the cases I made was from Chico Hayasaki’s collection from Kei Fabrics. The fabric is very light yet buttery soft. Peter was very jealous of the case, so I made him one. I wrote these instructions eons ago, but they still work! I should know, as I had to refer to them to make the cases! Heyyyyyy, so I have been doing a bit of sewing. I’ve been trying to “style up” a bit lately, but I realized that I am incapable and unwilling to stray too far from my comfort zone, so I decided that maybe I should just stick with what I like (comfortable, practical stuff, preferably in stretchy and warm fabrics) and just do something slightly different with them. 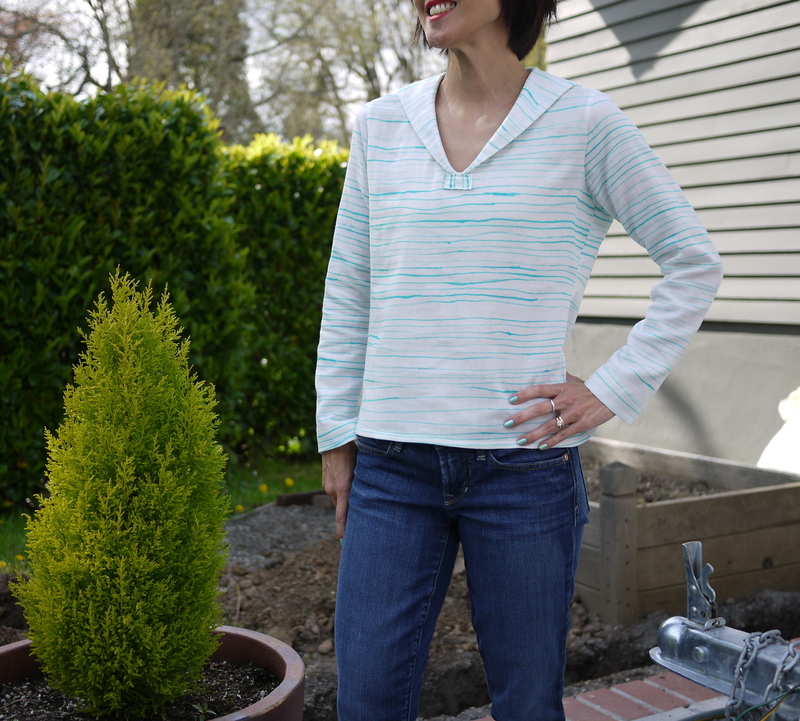 I found this heavy, organic French terry at Rose City Textiles and made up my own pattern. I basically just took a T-shirt pattern and added on. The fabric is quite heavy, so wearing this does sort of feel like wearing one of those X-ray vests they have at the dentist, but you know, I kind of love those X-ray vests, so I am happy with the tunic. Before I made this one I made a sample out of some vintage polyester. I’m not quite sure how to identify it. It isn’t double-knit because it is on the thin side. Did they ever have something called single-knit? It is also NOT stretchy at all. Anyway, IT IS AWESOME, and I love it. It feels like I am wearing some sort of plastic shield. Peter cannot touch it because it grosses him out. I find it is an effective wind barrier. I’ll take a photo of it one of these days. 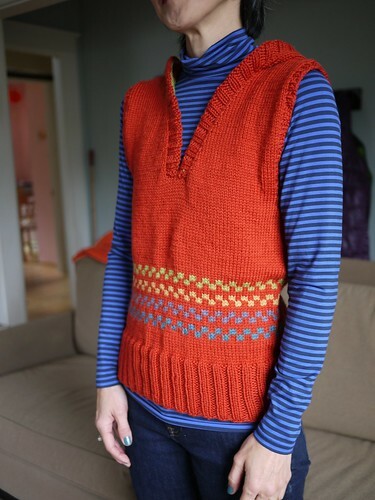 Finally, a finished knitting project, originally uploaded by super eggplant. I started this Spud & Chloe “camp hoodie” a couple years ago. I finished the entire body and was halfway up the hood when I just, well, stopped knitting. I’m not sure what happened, but I just didn’t feel like knitting. That lasted a couple of years. I now seem to have gotten some knitting mojo back. I don’t know how long it will last, but I am hoping it sticks around for a while! Anyway, I finally managed to finish the hoodie. Unfortunately, I am not all that happy with it. It doesn’t really fit me very well, and I think it looks poorly knit (maybe because it IS poorly knit). Maybe I will like it better after I have thrown it in the wash (and I CAN throw it in the wash because I used KnitPicks Swish that is washable). One good thing is it is really quite warm. I really love KnitPicks Swish. It is super soft and cozy. Here’s a question for you–how are some women able to wear these gathered, loose-fitting, tunic-y tops and not look maternity? I am attracted to these gathered shirts, but I don’t think Clinton and Stacy would approve. Regardless, let’s focus on the positive, one of which is that this is Hello Kitty Liberty of London fabric, and it is lovely! 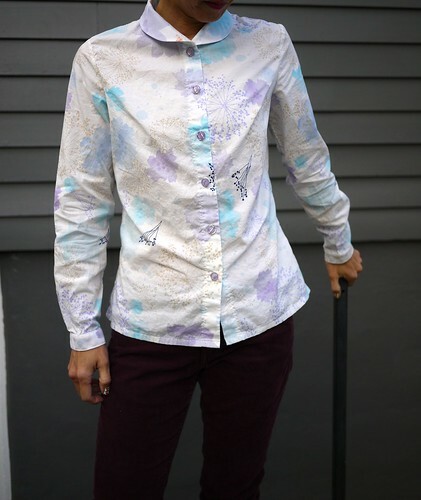 I made this top from one yard of fabric! I used a pattern from a great Japanese mook called I Love Liberty Print (ISBN 978-4-408-63261-2). The pattern was even more billowy and maternity than it is here. I had to bring it way in! It is really comfortable and perfect for hot days. I just need to kind of hold in the sides so I don’t look pregnant. made another t-shirt, originally uploaded by super eggplant. My sole reader was bugging me about not blogging, so here you go, Carolyn! 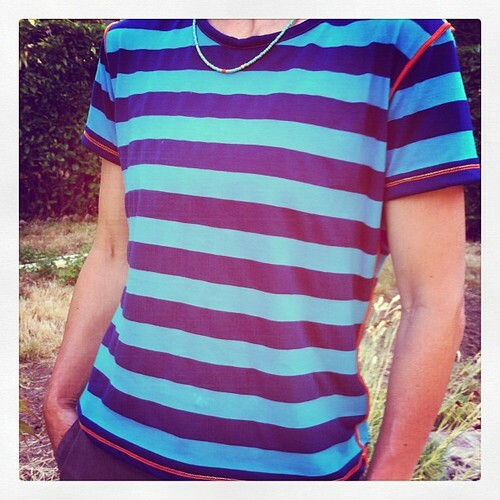 So, I don’t know about you, but I am always searching for the Perfect T-shirt Fit (TM). Unfortunately, I can be a bit finicky, and what is perfect one day may not be so perfect the next. Anyway, I decided I needed a comfy, not-super-fitted T-shirt, so I made a pattern based on a T-shirt I have that I really like. I used some leftover fabric (some cotton blend) and used the flatlock on my serger, and voila. The shoulders are actually a bit big, so I sized the pattern down a little bit for the next attempt. I got a new sewing machine–an industrial machine by Sailrite–so my jeans experimentation should continue if I am not too lazy. I got drunk and put the placket in the wrong spot. Kidding. I MEANT TO DO THAT (does anyone recognize that line? It’s from one of my favorite films). Anyway, I had some nani iro knit sitting in a pile, so, yes, I made another t-shirt. And, yes, it is also in that rather unflattering dirt color. Apparently I have been attracted to this color as of late. Clearly I need a personal shopper. 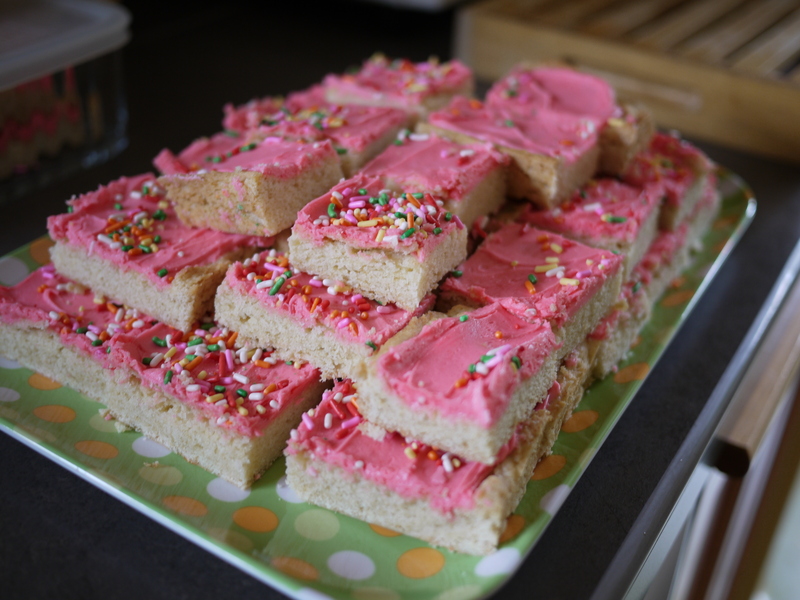 These are actually Fake Lofthouse Sugar Cookie Bars. Now, I realize that I am in the minority because I genuinely like Lofthouse Sugar Cookies (you’ve all no doubt seen them in the grocery store–sugar cookies with day-glo frosting and sprinkles, packaged in those clear plastic clamshell boxes), but when I saw the recipe for homemade ones, I had to give them a try. I took them to a gathering, and I thought most would consider them too sweet and just generally too repulsive looking to even try, but you know what? They were universally liked! Very surprising! The cookie part is soft and delicious. I think next time I might try them with chocolate frosting. Mmmm. I used this recipe from Cookies and Cups. Hey! I made yet another t-shirt! This time I added a fancy little placket. It actually is not very fancy, and I screwed it up, but I kind of have a thing for plackets, so I was willing to suffer a bit for it. 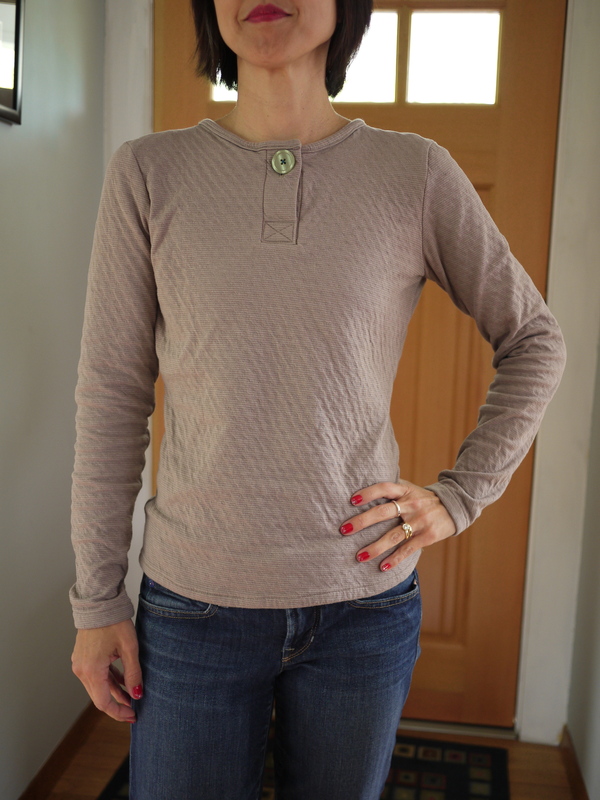 The shirt is a double-layer cotton knit. The inner side is a super soft pointelle knit. It is super cozy, so I don’t really care that this color does nothing for my skin tone. Hey, I’ll just put on brightly colored lipstick, and nobody will even notice! Hey, sailors! I finally managed to get to the sewing machine this weekend. I had been hoarding this double gauze for years and decided it was high time I used it for something. 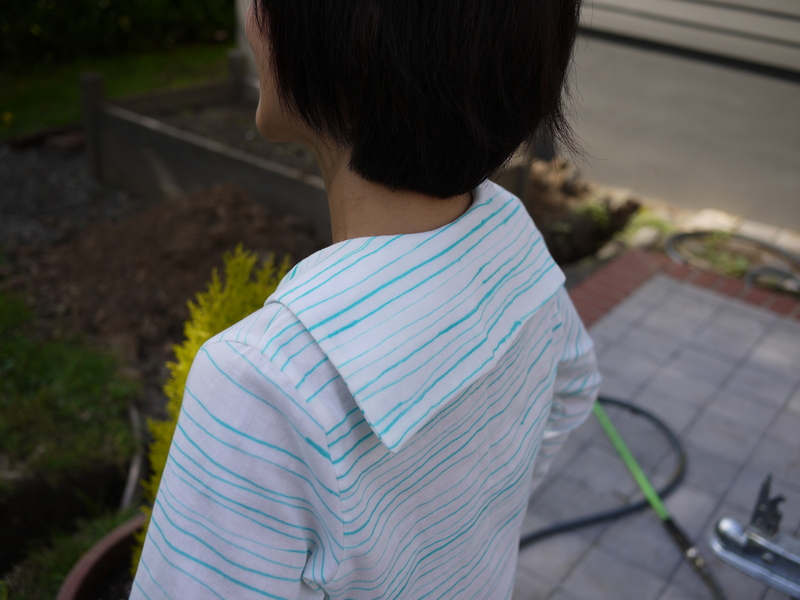 I had also been meaning to make the sailor collar top from Machiko Kayaki’s “simple but good looking” book (Kinokuniya has it available here). 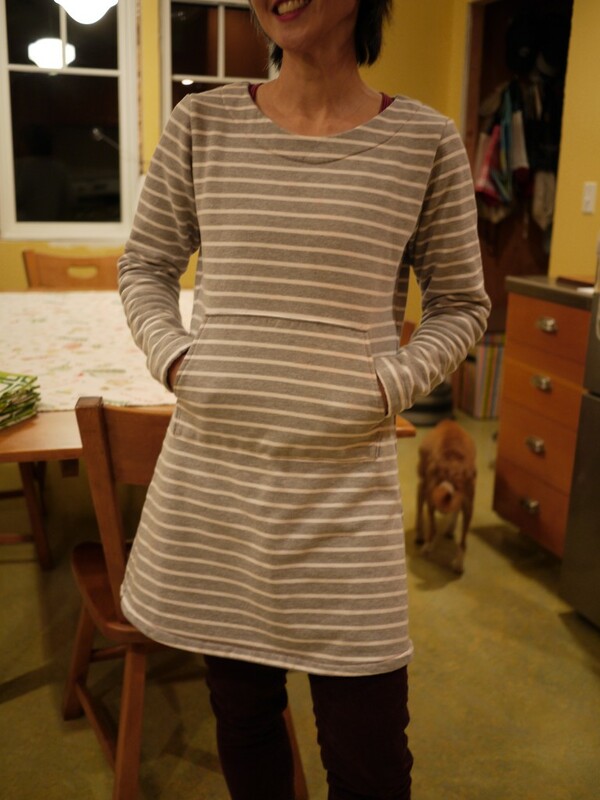 I frankensteined the pattern a bit, since the original pattern is for a top with a French sleeve (I think that’s what it’s called), and I wanted long sleeves. I struggled a bit with the neckline (the V part was a bit tricky for me), and it requires some contortionist moves to get off (I already got lipstick on it while taking it off), but overall I think I like it. By the way, it is merely a coincidence, but my nail polish (Deborah Lippmann “mermaid’s dream”) matches the blue in the double gauze perfectly. I cannot tell you how much I love this nail polish. Well, I guess I just did.